Croydon Minster has a long and distinguished history. It is believed to have been founded in Saxon times, since there is a record of “a priest of Croydon” in 960, although the first record of a church building is in Domesday Book (1086). The church has had close links with the Archbishops of Canterbury who had a Palace in Croydon. Much of that building still stands next to the Minster and is now the Old Palace of John Whitgift School. Six Archbishops of Canterbury are buried in the Minster and many more would have worshipped here. Kings and queens were regular visitors to the archbishops at Croydon - visits by Henry VII, Henry VIII and Queen Elizabeth I are all well documented. Ten bishops have been consecrated here and the church continues to be regularly used for ordinations and major diocesan and civic services, as well as for the daily parish worship. In its final medieval form, the Minster was mainly a Perpendicular-style structure, but this was severely damaged by fire in 1867, following which only the tower, south porch and outer walls remained. Under the direction of Sir George Gilbert Scott the church was rebuilt, incorporating the remains and essentially following the design of the medieval building, and was reconsecrated in 1870. It still contains several important monuments and fittings saved from the old church. The main entrance to the church is through the west door beneath the predominantly medieval tower, 125 feet high to the top of the pinnacles. Above the west door can be seen the arms of Archbishops Courtenay and Chicheley, who were mainly responsible for the building in the 14th and 15th centuries. The church is almost 150 feet in length from east to west. The nave (the main body of the church) is 92 feet high and has a fine open timber-work roof supported by angel corbels. The original eagle lectern, a fine specimen of 15th century brass work, with small lions at its feet, is still in regular use. The nave is one of the few such pre-Reformation lecterns remaining in this country. The Victorian pulpit, ornamented by carved figures of saints, is by Thompson of Peterborough. There are a number of medieval remains in the north aisle. These include an ornamental recess, said formerly to have been a holy water stoup (a basin for holy water), and a larger recess (possibly for a tomb) containing the remains of a double piscina (in which the communion chalice would have been washed) and a late 15th century altar tomb. The distinguished American-born artist, John Singleton Copley R.A. (1737-1815), is commemorated by a plaque. On the same wall may be seen a brass inscription to Elys Davy (died 1455), who founded nearby almshouses, and brass shields which formed part of a memorial to Thomas Heron (died 1544). The chancel is richly decorated, notably the waggon-shaped oak roof, supported by angel corbels, some of them gilded and holding musical instruments. The pointed arch in the north wall is formed of Early English fragments, below which is a Victorian fresco of the feeding of the 5,000. 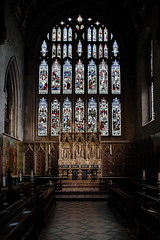 The east wall is filled by a large Perpendicular-style window, containing fine glass depicting New Testament scenes by one of the best known Victorian firms, Clayton and Bell; and, beneath, a rich alabaster reredos (the ornamental screen behind the High Altar) carved with reliefs of the nativity, crucifixion and resurrection. The Victorian altar frontal has recently been restored to its original splendour. In the south wall are elaborate piscina and sedilia (priests' seats), the latter incorporating painted roundels of three archbishops. There are a number of brasses inside the chancel arch. William Heron (died 1562) and his wife are commemorated on the north side, while the large figure on the south side commemorates Gabriel Sylvester (died 1513) who was Master of Clare College, Cambridge and is depicted as a priest in vestments. The choir stalls feature some interesting and curious carvings on the bench ends, which repay closer study. To the north of the chancel is the Victorian organ, built by Hill and Son and whose oak case was decorated by J. Oldrid Scott. A second smaller organ, acquired recently from a village church in Hampshire, can be seen in the St. Nicholas Chapel. 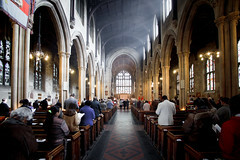 The church is a regular venue for recitals and concerts. Both side chapels are on the site of earlier chantry chapels (a chapel paid for by a patron for whom prayers would be said on his or her death). In the St Nicholas or Bishop's Chapel is the large coloured monument to John Whitgift (died 1604), who was Archbishop of Canterbury during the reign of Elizabeth I and at the start of that of James I. Whitgift was a major local benefactor, who founded the old almshouses (dated 1596) which can still be seen in the town centre. Schools and the Whitgift shopping centre also perpetuate his name. Archbishop Whitgift's tomb shows him lying in prayer, surrounded by allegorical figures and cherubs. Next to it is a 16th century carved tomb chest believed to be that of Hugh Warham, brother of another Archbishop. The memorial of Archbishop Wake (died 1736/7) was dedicated by his successor, Archbishop Runcie, in 1989. In the south aisle, behind iron railings, is the white marble monument (still slightly damaged) to Archbishop Sheldon, who founded the Sheldonian Theatre in Oxford and died in Croydon in 1677. Emblems of mortality are carved beneath his reclining figure. Nearby is another remnant of the brass to Thomas Heron (1544), depicting his daughters. Also in this wall are two small recesses, one though to be an aumbry with a piscina drain inserted, the other closer to the porch probably a former holy water stoup. The south porch, with its parvise and original vaulting, dates from the 15th century, although this is not usually accessible (the exterior can, however, be seen from the memorial garden south of the church). The octagonal font is Victorian and has a very tall canopy, carved with figures of archbishops. West of the font is a restored tomb recess, and beneath the west window there are fragments from an old tomb (Nicholas Heron, 1568). The Minster, dedicated to St John the Baptist, is the Mother Church of Croydon, and as the Civic Church plays an important role in the life of the borough. Over the years it has been involved in many developments in the fields of housing, education, counselling services, and other contributions to the local community. The vicar and the Minster continue to be actively involved in many of the town's institutions.